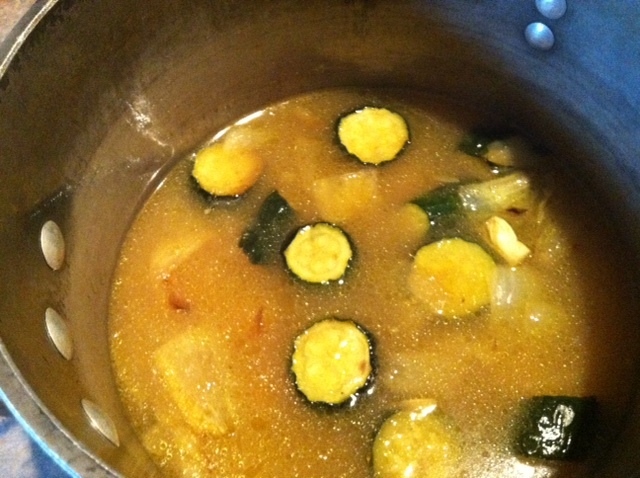 I happen to like the flavor of zucchini, and its adaptability to a variety of dishes. We grill, fry, shred, and bake zucchini; eating them as a vegetable when they are round, shredded, in ribbons and sticks. We bake bread, cakes and brownies. Maybe their overpopulation late in the summer has forced such creativity, but Ms. Anderson’s soup of disrespect was not something I had considered for zucchini before, so I had to try it. I’ve been carrying this recipe around in my briefcase since June when it was first posted, so today was the day! True to nature, I didn’t have some of the ingredients and didn’t have enough zucchini to make her full batch, so here is my version. I also didn’t have some of the equipment she called for, so had to improvise on technique as well. 1/2 onion, cut into 1″ chunks toss to evenly coat veggies. Roast, stirring every 15 minutes, until golden brown (about 45 minutes). At this point the roasted garlic smell is to die for! Remove roasted vegetables from baking pan to large soup pot. Add stock and bring to a boil over high heat, then reduce to medium heat and simmer for about 5 minutes. At this point, the recipe instructs you to turn off the heat, add half the Boursin to the soup and puree in the pot with an immersion blender. The immersion blender being the equipment I lack, I removed the roasted vegetables from the pot to my food processor, pureed, then added 1/2 my cream cheese mixture and pulsed until thoroughly blended. At this point it looked like potato soup with green bits. I added the vegetable puree back to the pot with chicken stock, and combined with a whisk. Garnish the soup with the remaining cream cheese mixture. My daughter wasn’t going to let me add anything to her soup until she tasted and approved it, but she did. 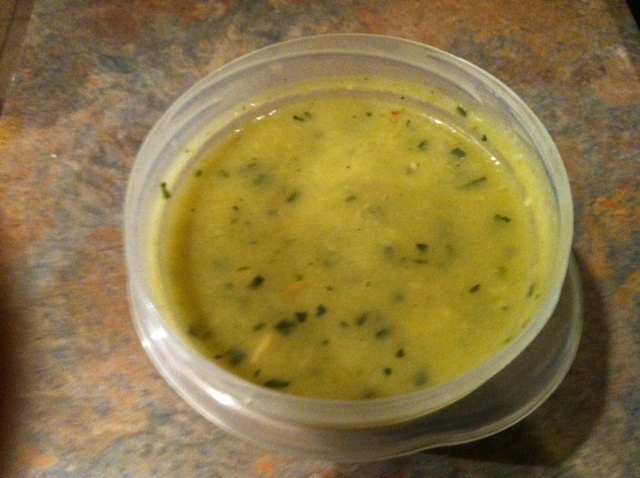 I served the soup with a garlic and herb flatbread from Frugal Feeding. 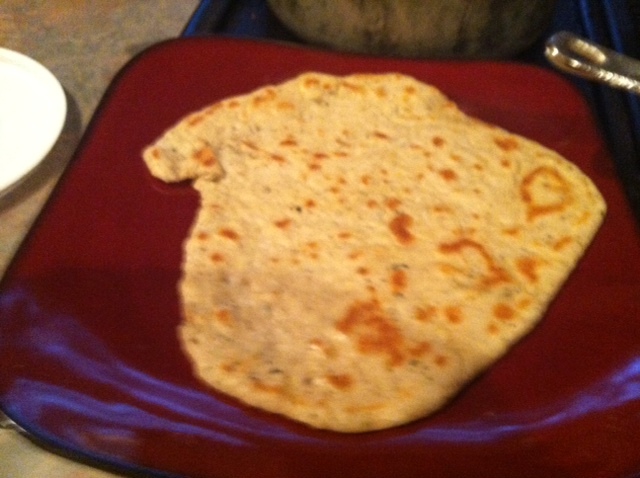 This entry was posted in Recipes and tagged Boursin, flatbread, onion, roasted garlic, zucchini. Bookmark the permalink.